This is basically a Kumaoni snack prepared from Boiled Pahari Potatoes, but it is prerpared all across uttarakhanda and a s a maincourse food. 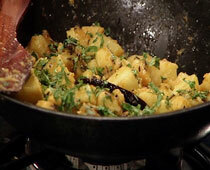 5.Add boil potatoes pieces with Coriander powder and Salt. 7.Garnish with chopped green Coriander and fried chillies.